Whilst the vets will, of course, be present at the auction to answer any questions you may have, the findings on the x-rays will be published for all to see, in the catalogue. For in depth enquiries as to the x-rays, clinical state of the horses or past history the vets will be available to answer any questions you may have. 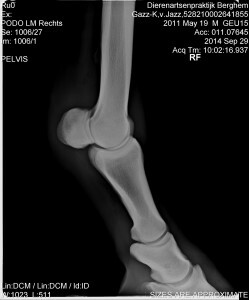 On request, vetting reports and x-rays can be forwarded to your own veterinarian for examination. In the event that you would like to have your own veterinarian examine the horse or take additional extra x-rays, this is of course possible. The vettings will be conducted by the veterinary practice in Someren & Veterinary centre Honselersdijk, reknowned as two of the most stringent veterinary practices in the Netherlands. Dr T. Spierings – Certified equine specialist. What exactly is done during the vettings? The possibilities in vetting a horse are endless, as are the costs – think of clinicals, x-rays, echography, MRI’s, blood tests and countless others. Equine Elite therefore takes it’s vetting advice according to the guidelines as set out by the insurance company (Equipe Equine Insurance) and their requirements for cover. Flexion Tests, stress tests, examinations of coat,heart, lungs, eyes and airway. NOTE: Anno 2016 certain Neck and Back X-rays have become mandatory for full “loss of use” insurance – Per 1-1-2017 Equine Elite, has adjusted it’s vetting requirements accordingly making these x-rays mandatory for all ridden horses over 4 years of age. Anno 2017 a report has been filed by the German Veterinary association removing back & neck x-rays from the standard vetting practices citing that the data does not a provide reliable information pertaining to the health of the horse. Files regarding known aspects of the horse, health, treatments, known history, Studbook Papers and Passports are maintained by the organisation and updated right up to the day of auction. Upon request this information is available to anyone who requests it at the auction office or can alternatively be sent per e-mail along with veterinary reports & x-rays.